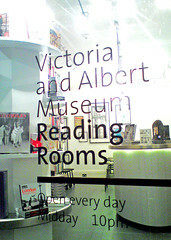 I’m sure it’s not a brand new idea, but I like the brand new V&A Reading Rooms at 8 Exhibition Road, South Kensington. Very much. I like Waterstones’ 5th View bar in their flagship Piccadilly store too but that’s more of a bar, set up in the confines of a bookshop. I like combined bookshops and coffee shops too, but you can’t usually get a glass of something strong yet uncaffeinated. And you never seem particularly encouraged to slosh your coffee around near many books. I – and a few friends – did so choose. 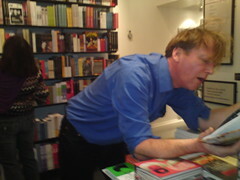 We spent a couple of hours in the shop, consumed quite a lot of wine, and ended up buying quite a few books too. The brillance of the idea is that this is designed as a browsing bookshop. 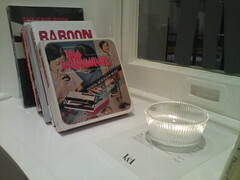 The selection of 1000 or so titles are shelved randomly, with odd titles piled up on candle-lit window ledges just crying out to be flicked through in between sips of liquid refreshment. There are even spaces within the shelving arrangement, specifically designed for you to perch your drink while you pick up a book. 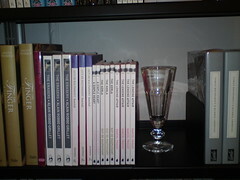 as follow-up, my Glass #1 purchase, Letters from a Professional Nuisance, turned out to be ideal nightstand reading, and my Glass #2 purchase, Cherry Blossoms: Traditional Patterns in Japanese Design, was a lovely one-time read that will decorate a bookshelf nicely. Actually, at £25, it may turn up under someone’s tree next Christmas… Next time I’ll make my book purchases earlier in the evening. Not too bad in terms of investments then? Sounds great and can’t wait to visit it with you!